Agilis Marketing offers a wide array of SEM solutions to help companies increase the ROI on marketing initiatives. Towards the beginning of all search engine marketing campaigns, it is important to develop a strategy that matches the objectives of the campaign. We typically suggest a heavy emphasis on natural search engine optimization. However, all our clients offerings are unique and other forms of search engine marketing may also be appropriate. Below are the most common types of SEM mediums used in a campaign. Please feel free to contact us with any questions. Natural search engine optimization or SEO is often the most effective means of SEM available. Visitors who reach a website from natural search engine queries oftentimes stay there much longer and look at the site in more detail than those who arrive from another avenue. As a result, this is usually the most effective marketing medium to focus a campaign upon. 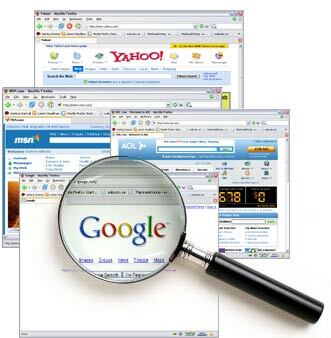 Unlike the other types of SEM, natural search results are much longer lasting. Once a website reaches the top of the results it tends to stay there. Whereas with PPC marketing, the moment the advertiser decides to stop spending money its listings disappear. The major drawback is that it normally takes longer for website to reach the top of the natural results. At Agilis Marketing we understand that it is well worth the wait and that other SEM mediums can be utilized in the interim. PPC management can be an excellent supplement to a natural SEO campaign if implemented correctly. The key is to keep in mind that it is unlikely to deliver the same high ROI that a well executed natural search engine optimization campaign will. However pay per click management can be ideal for website with a large number of products and companies looking to make an immediate presence on the web. Additionally, PPC can help achieve a larger market share than is obtainable with only SEO. Pay-per-click advertising can also provide a jumpstart to a website’s revenues while waiting for natural results to appear. Sites with thousands of products should not overlook the power of listing their catalogs in shopping engines such as Froogle, BizRate, Shopzilla, and others. This holds especially true for companies with a large number of products for sale. While most people still first turn to Google, Yahoo, and MSN when searching for a product, a large enough minority also turn to these shopping engines, which make it worthwhile to add listings to their catalogs. Websites’ selling products that sell to niche markets tend to perform well with contextual advertisements. These SEM advertisements are oftentimes inserted within or placed along the right hand column of blogs and news sites. When trying to reach a niche market, these can be extremely effective mediums. Contextual advertisements tend to also come with the added benefit of providing a boost to natural search positions. This benefit is derived from the importance of links. For example, the following link is somewhat contextual since it is included in the body copy and relates to SEM: SEO Services in India - VOCSO WEB STUDIO is the best SEO Internet Marketing Company which offers high quality SEO Internet Marketing, SEM Services and SEO Services In India at reasonable prices. You can rank for all the keywords you want but if your online reputation is bad it will be hard to covert those website visitors. This way when potential customers search for your company name they only see positive information about your company. Our friends at McKremie offer a search engine reputation management service for those on the West coast to help get those negative reviews pushed down. Those on the east coast our encouraged to try Agilis Marketing's personal reputation management. It's estimated that nine out of ten people will research your company before deciding to do business with you online.